Julio Francis Ribeiro joined the Indian Police Service in 1953 and has served in different districts of Maharashtrai. 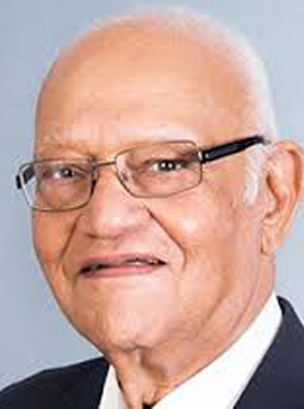 He was on deputation to the Central Reserve Police Force for six years from 1973 to 1979. Later he became the Commissioner of Police, Mumbai. He moved to Delhi as Director General Central Reserve Police Force, in June 1985, but was soon shifted to Ahmedabad as Director General of Police Gujarat, during the communal riots. Having successfully dealt with the problem he was made Special Secretary to the Government of India’s Home Department. Before he completed even six months in that position he was sent to Punjab as Director General of Police at the height of terrorism in that State. Later he became Advisor to the Governor of Punjab. After retirement he was appointed Ambassador to Romania with concurrent accreditation to Albania and Moldova. In 1986, the “Telegraph” of Calcutta and the fortnightly “Frontline” published by the ‘Hindu’ of Madras named him as India’s Man of the Year. The ‘New York Times’, ‘Time’ and ‘Newsweek’ of America also mentioned his contribution to fighting terrorism in Punjab. Because of his qualities of head and heart he became known as the country’s first ‘Super Cop’. He is also associated with many charitable institutions like The Happy Home &amp; School for the Blind and The Bombay Mothers &amp; Children Welfare Society. He was awarded the Padma Bhushan in 1987 in recognition of his services to the nation.